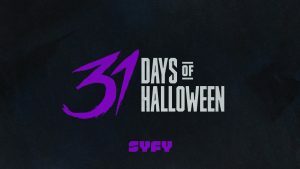 This October, SYFY is the destination for non-stop horror as the network celebrates its 10th annual 31 DAYS OF HALLOWEEN programming event. The chilling lineup airs all day and night throughout the month, and includes the premieres of five terrifying original movies, a new installment of the acclaimed anthology series CHANNEL ZERO, spooky new seasons of SYFY series VAN HELSING and Z NATION, a variety of cult horror flicks, and deep dives into all things horror on genre news destination SYFY WIRE. CHANNEL ZERO returns with THE DREAM DOOR, the anthology series’ latest installment based on the “creepypasta” short story “Hidden Door” by Charlotte Bywater. Premiering over six consecutive nights from Friday, October 26th through Halloween Night, Wednesday, October 31st at 11/10c, CHANNEL ZERO: THE DREAM DOOR follows newlyweds Jillian and Tom, who have each brought secrets into their marriage. When they discover a strange door in their basement, those secrets start to threaten their relationship and their lives. Created by Nick Antosca, CHANNEL ZERO: THE DREAM DOOR is directed by Evan Katz (“Small Crimes,” “Cheap Thrills”) and stars Brandon Scott (“Grey’s Anatomy”), Maria Sten (“Straight Outta Compton”), Steven Robertson (“Elementary”), Troy James (“The Strain”), Steven Weber (“Wings”) and Barbara Crampton (“You’re Next”). Following the premiere on October 26, all 6 episodes will be available on VOD. Sabrina’s perfectly planned high school reunion goes south when a monster keeps killing all the guests in this horror-comedy. Starring Kacey Rohl (THE MAGICIANS, “Hannibal”), Asha Bromfield (“Riverdale”) and Varun Saranga (WYNONNA EARP). Who else is ready for Halloween?